Every summer we spend at least one morning picking strawberries at an organic farm that has a pick-your-own berry field. It’s a nice place, well-kept and nicely laid-out with one hundred rows that are each five hundred feet long. The owners weigh the container you plan to pick into and then weigh the container and the berries after you have finished picking. 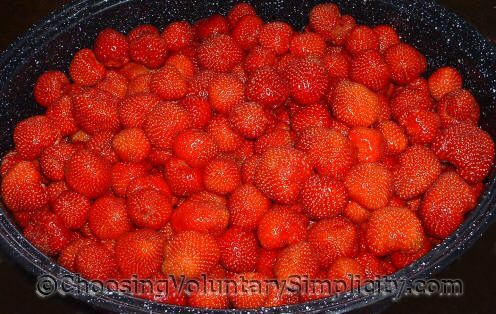 This year the price was $2.50 per pound, and although that is more expensive than another (not organic) pick-your-own berry place nearby, I think it’s worth it to know that we’re not eating chemicals along with the berries. This is what $25.00 worth of strawberries looks like these days! Seems like a lot of money for not too many berries, but I’m glad to have them. I froze most of the berries and mashed some to serve with the sponge cake I made for dessert. The berries were tart, fairly small, and not as dark a red as some berries but they had a very strong strawberry flavor, which the owners of the berry place told us were the characteristics of the variety of berries they had available for picking that day. We all really enjoy picking berries… even though the weather was cloudy and overcast it was still a beautiful day! Lookin’ good! We found pick your own berries this year for $2.25 a pound. Like yours they were unsprayed. I think that is worth the higher price. I love strawberries, and those look good enough to reach out and grab one. I bought a box of 24 strawberry plants and planted them in April. I’m hoping to have my own strawberries this coming year.